While the Co-Optimus crew wasn't able to make it to E3 this year to check out all the new and exciting games for ourselves, there are plenty of folks from other outlets that are sharing their impressions from the little bits they're allowed to play. In the case of A Way Out, it sounds like most folks are presented with a short segment in which the two main characters (Leo and Vincent) must rob a gas station. The way they go about this, i.e., who they talk to in the gas station, what kind of distraction they make, do they go all out or try to be more subtle, is unique to each one for each co-op pair gets to talk and decide for themselves how they want to do it, and then make adjustments on the fly when that goes wrong. Mike Williams from USGamer, James Davenport and Samuel Roberts from PC Gamer, and Nick Robinson from Polygon all got their hands on it and, in their own way, all described something that I haven't seen much of in co-op games of late: a story that's defined by the players. Key decisions in the game must be made by both players. For instance, prior to the gas station robbery, players have to decide which of the two protagonists will get the gun. Both players have to make the same choice in the protagonist in order to proceed. This is, according to the creative director Josef Farres, intended to force players to have a discussion and feel committed to the choices they make. Along with that, in the video above with Nick Robinson and Justin McElroy from Polygon, Nick gives some examples of how the dynamic splitscreen works. It doesn't always divide the players, for instance when they're both in the same scene, and sometimes it pulls some real cinematic tricks, like shifting to a sideways wideshot of just one character running down a corridor. This is something very new with telling stories in games and making it so that both players feel like cinematic heroes. Supporting all of this, though, is the idea that it is the players themselves that are leading to certain things occurring and that they are making those choices and driving that story together. Think back to when Left 4 Dead first came out. Think about that story you and your friends told of that one time you or one of your buddies pulled out a victory from what seemed like an certain defeat. Now, think about you and a buddy telling a similar story about how you escaped from a prison, or getting into an argument over how that robbery went so wrong. 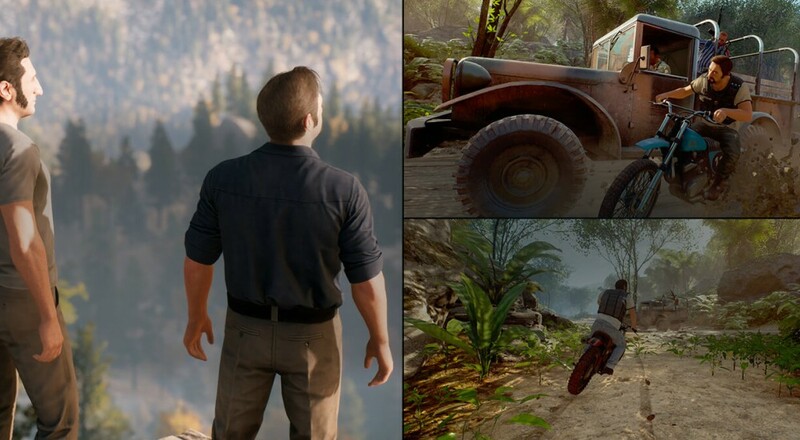 There's definitely something here that's worth getting excited about, and hopefully it all pans out for Hazelight and A Way Out. Page created in 1.2178 seconds.